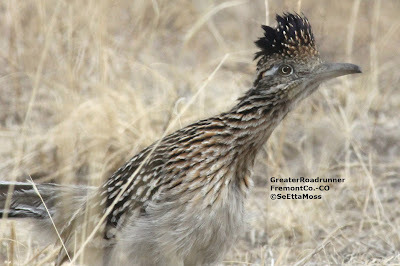 I spotted this Greater Roadrunner south of where I live just over a week ago but I twisted my knee so wasn't up to sitting at my computer to upload and process these pics. This roadrunner spent about 10 minutes just perched behind some grass (first two pics), presumably it thought it was hidden behind the grass. When it moved, it moved quickly across short open stretches then slowed again when behind a few blades of tall grass, even stopping to stretch as shown just above.